Charles Lincoln Van Doren (February 12, 1926 – April 9, 2019)  was an American writer and editor who was involved in a television quiz show scandal in the 1950s. In 1959 he testified before the United States Congress that he had been given the correct answers by the producers of the show Twenty-One . Terminated by NBC, he joined Encyclopædia Britannica, Inc., in 1959, becoming a vice-president and writing and editing many books before retiring in 1982. The American quiz show scandals of the 1950s were a series of revelations that contestants of several popular television quiz shows were secretly given assistance by the show's producers to arrange the outcome of an ostensibly fair competition. The quiz show scandals were driven by a variety of reasons. Some of those reasons included the drive for financial gain, the willingness of contestants to "play along" with the assistance, and the lack of then-current regulations prohibiting the rigging of game shows. Twenty-One is an American game show originally hosted by Jack Barry which aired on NBC from 1956 to 1958. Produced by Jack Barry-Dan Enright Productions, two contestants competed against each other in separate isolation booths, answering general knowledge questions to earn 21 total points. The program became notorious for being a rigged quiz show which nearly caused the demise of the entire genre in the wake of United States Senate investigations. The 1994 movie Quiz Show is based on these events. A new version of the show aired in 2000 with Maury Povich hosting, lasting about four months, again on NBC. Mark Van Doren was an American poet, writer and critic. He was a scholar and a professor of English at Columbia University for nearly 40 years, where he inspired a generation of influential writers and thinkers including Thomas Merton, Robert Lax, John Berryman, Whittaker Chambers, and Beat Generation writers such as Allen Ginsberg and Jack Kerouac. He was literary editor of The Nation, in New York City (1924–1928), and its film critic, 1935 to 1938. Herbert Milton Stempel is an American television game show contestant and subsequent whistleblower on the fraudulent nature of the industry, in what became known as the 1950s quiz show scandals. 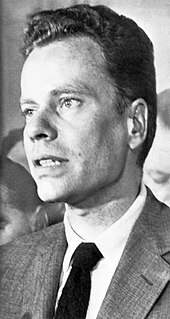 His rigged six-week appearance as a winning contestant on the 1950s show Twenty-One ended in an equally rigged defeat by Columbia University teacher and literary scion Charles Van Doren. David Cunningham Garroway was an American television personality. He was the founding host and anchor of NBC's Today from 1952 to 1961. His easygoing and relaxing style belied a lifelong battle with depression. Garroway has been honored for his contributions to radio and television with a star for each on the Hollywood Walk of Fame as well as the St. Louis Walk of Fame, the city where he spent part of his teenage years and early adulthood. Wide Wide World was a 90-minute documentary series telecast live on NBC on Sunday afternoons at 4pm Eastern. 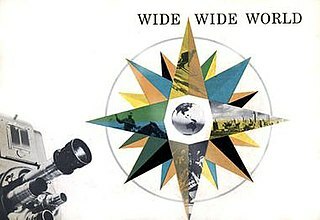 Conceived by network head Pat Weaver and hosted by Dave Garroway, Wide Wide World was introduced on the Producers' Showcase series on June 27, 1955. The premiere episode, featuring entertainment from the US, Canada and Mexico, was the first international North American telecast in the history of the medium. One month after the hearings began, Van Doren emerged from hiding and confessed before the committee that he had been complicit in the fraud. On November 2, 1959, he admitted to the House Subcommittee on Legislative Oversight, a United States Congress subcommittee, chaired by Arkansas Democrat Oren Harris, that he had been given questions and answers in advance of the show. I was involved, deeply involved, in a deception. The fact that I, too, was very much deceived cannot keep me from being the principal victim of that deception, because I was its principal symbol. There may be a kind of justice in that. I don't know. I do know, and I can say it proudly to this committee, that since Friday, October 16, when I finally came to a full understanding of what I had done and of what I must do, I have taken a number of steps toward trying to make up for it. I have a long way to go. I have deceived my friends, and I had millions of them. Whatever their feeling for me now, my affection for them is stronger today than ever before. I am making this statement because of them. I hope my being here will serve them well and lastingly. Some of you read with me 40 years ago a portion of Aristotle's Ethics , a selection of passages that describe his idea of happiness. You may not remember too well. I remember better, because, despite the abrupt caesura in my academic career that occurred in 1959, I have gone on teaching the humanities almost continually to students of all kinds and ages. In case you don't remember, then, I remind you that according to Aristotle happiness is not a feeling or sensation but instead is the quality of a whole life. The emphasis is on "whole," a life from beginning to end. Especially the end. The last part, the part you're now approaching, was for Aristotle the most important for happiness. It makes sense, doesn't it? The July 28, 2008, issue of The New Yorker included a personal reminiscence titled "All the Answers", written by Van Doren, in which he recounted in detail the scandals and their aftermath. Other than very occasional and often very abbreviated references to it, Van Doren had never before spoken publicly about the scandal, his role, and its effects on his life. He referred to the film Quiz Show, saying he was bothered most by the closing credits' reference that he never taught again: "I didn't stop teaching, though it was a long time before I taught again in a college." But he also said he enjoyed John Turturro's portrayal of his Twenty-One rival, Herb Stempel. The article also contradicted many impressions of Van Doren that the film had created: the film portrayed him as a bachelor when he was actually engaged; it suggested he had a fascination with the burgeoning, popular television quiz shows when in fact he did not even own a television set; that the only reason he became even mildly acquainted with Twenty-One was because co-producer Al Freedman shared a mutual acquaintance with one of Van Doren's friends; and that he had been offered his job with Today promptly after losing to Vivien Nearing when, in fact, NBC was not sure at first what to do with him, until he did work for Dave Garroway's Sunday afternoon cultural show, Wide Wide World , which then led to the invitation to join Today. Van Doren also addressed and denied the film's insinuations that he had been friends with Congressional investigator Richard Goodwin while Van Doren was Twenty-One's reigning champion (and during and after the start of Herb Stempel's efforts to expose the show's being rigged). According to Van Doren, the two men had not met until August 1959, when the subcommittee Goodwin served as counsel for had begun investigating the quiz shows and Van Doren was already established on The Today Show. The producers of Quiz Show sought his assistance as a consultant, but Van Doren declined. Mortimer Jerome Adler was an American philosopher, educator, and popular author. As a philosopher he worked within the Aristotelian and Thomistic traditions. He lived for long stretches in New York City, Chicago, San Francisco, and San Mateo, California. He worked for Columbia University, the University of Chicago, Encyclopædia Britannica, and Adler's own Institute for Philosophical Research. The year 1958 in television involved some significant events. Below is a list of television-related events during 1958. The $64,000 Question was an American game show broadcast from 1955 to 1958, which became embroiled in the 1950s quiz show scandals. Contestants answered general knowledge questions, earning money which doubled as the questions became more difficult. The final question had a top prize of $64,000, hence the "$64,000 Question" in the show's title. J. Fred Muggs is a chimpanzee born in the African colony of French Cameroon that forms part of modern day Cameroon. Brought to New York City before his first birthday, he was bought by two former NBC pages and eventually appeared on a host of television shows on that network including NBC's Today Show where he served as mascot from 1953 to 1957. Muggs worked in several television shows including a short-lived eponymous series, toured the world and worked at Busch Gardens in Tampa, Florida. He officially retired at age 23. As of January 2012, Muggs was still alive. Chimpanzees have been known to live up to 70 years, though 50 is more commonly the animal's lifespan. Jack Barry was an American television personality and executive who made a name for himself in the game show field. Barry served as host of several game shows in his career, many of which he developed along with Dan Enright as part of their joint operation Barry & Enright Productions. Clifton Paul "Kip" Fadiman was an American intellectual, author, editor, radio and television personality. He began his work with the radio, and switched to television later in his career. 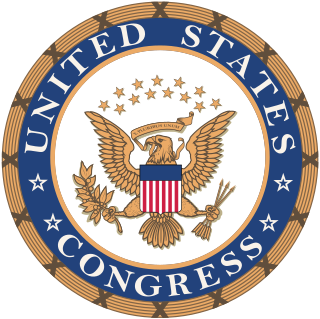 Steven Boghos Derounian was a Republican Congressman of Armenian-American descent. Dotto was an American television game show that was a combination of a general knowledge quiz and the children's game connect the dots. Jack Narz served as the program's host, with Colgate-Palmolive as its presenting sponsor. Dotto rose to become the highest rated daytime program in television history, as of 1958. Dorothy Graffe Van Doren was an American writer and editor. John Dennis Patrick O'Brian was an entertainment journalist best known for his longtime role as a television critic for New York Journal American. Zuckerman Unbound is a 1981 novel by the American author Philip Roth. Walter Balderson is an American television editor and video engineer, who participated in the advent of color television beginning in the early 1950s and later was one of the first editors to use videotape for instant replay on network television sports events. Nominated for three Emmys during his 35-year career with NBC (1949–1984), Balderson won an Emmy in 1977 for "Outstanding Individual Achievement", in recognition of his work on NBC's The First 50 Years special program. 1 2 3 McFadden, Robert D. (10 April 2019). 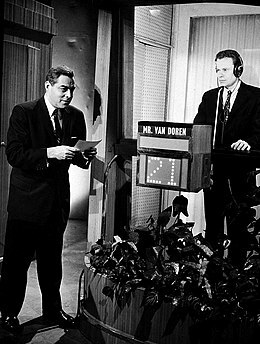 "Charles Van Doren, a Quiz Show Whiz Who Wasn't, Dies at 93". The New York Times. Retrieved 10 April 2019. ↑ Charles Van Doren. Encarta. Archived from the original on 2009-10-31. Retrieved 2008-08-13. ↑ Karp, Walter (May–June 1989). "The Quiz-Show Scandal". American Heritage . Vol. 40 no. 4. Retrieved 2018-06-07. 1 2 3 4 Van Doren, Charles (July 28, 2008). "All the Answers". The New Yorker. Retrieved 23 January 2018. ↑ Richard L. Lyons (November 3, 1959). "The Quiz Show Scandal". The Washington Post . ↑ "Charles Van Doren testimony". History Matters. Retrieved 2008-08-12. ↑ David Halberstam, "The Fifties" 1993, Ballantine Books, div. of Random House, chapter 43, page 663. ↑ William Manchester, "The Glory and the Dream" 1973, 1974, Little, Brown & Company (Boston—Canada), Volume 2, chapter 26, page 1043 (chapter notes reference The New York Times, 11/5/59 and 11/6/59). ↑ Associated Press (November 3, 1959). "Van Doren Confesses TV Fix". Pittsburgh Post-Gazette. pp. 1, 4. Retrieved 2018-06-07. ↑ "Text of Van Doren's Testimony at House Hearing on Fixed Television Quizzes; Subcommittee Is Told of Rehearsals and Coaching for the 'Twenty-one' Show". The New York Times. November 3, 1959. ↑ Alex Beam (July 21, 2008). "After 49 years, Charles Van Doren talks". The New York Times . ↑ Sandomir, Richard (22 April 2017). "Albert Freedman, Producer of Rigged 1950s Quiz Show, Dies at 95". The New York Times. Albert Freedman, a television producer who became a central figure in the quiz-show scandals of the 1950s for giving questions in advance to contestants — notably Charles Van Doren, an English instructor at Columbia University — died on April 11 in Greenbrae, Calif. He was 95. ↑ "How to Read a Book with Mortimer Adler and Charles Van Doren". YouTube. Retrieved 23 January 2018. ↑ In the "Editor's Preface," Mortimer Adler says that Charles Van Doren, as his "closest associate and executive editor," was the person who "coordinated and supervised the varied and complicated editorial operations involved in producing this set of books." Van Doren was also the main author of the historical essays that accompany the index as well as the period sketch that accompanies each volume of the document set. Mortimer Adler, "Editor's Preface," The Annals of America: Great Issues in American Life: A Conspectus, Vol. I (Chicago: Encyclopædia Britannica, 1968), p. vii. ↑ Stephens, Bret (12 April 2019). "Trump and the Annihilation of Shame". The New York Times. Retrieved 15 April 2019. ↑ "Today Show". The Today Show. December 4, 1985. NBC. ↑ "The Biggest Challenge of All". Columbia University. Archived from the original on 2008-03-09. Retrieved 2008-08-13. In June, an invitation from the Class of 1959 to speak at its reunion brought Charles Van Doren back to Columbia for only the second time in 40 years. ↑ "Guest Bio for Charles Van Doren". UCONN The Web People Litchfield County Writers Project. University of Connecticut. Retrieved 23 January 2018. ↑ "Scoville Library Speaker Series: Charles Van Doren — "The Lion of Cortona"". Oblong Books & Music. Retrieved 23 January 2018. ↑ McGee, Celia (October 15, 2011). "In New England, Taking on German Expressionism". The New York Times. Retrieved 2018-07-05. .
↑ "The Quiz Show Scandal". Michael Lawrence Films. Retrieved 2018-07-09. ↑ Rosenberg, Howard (January 6, 1992). "A Fascinating Documentary on the '50s Quiz Show Scandals". Los Angeles Times . Retrieved 2018-07-09. Thomas Doherty, "Quiz Show Scandals," The Museum of Broadcast Communications. Jeffrey Hart, "'Van Doren' and 'Redford'," National Review, 7 November 1994. Lina Lofaro, "Charles Van Doren Vs. the Quiz Show Dream Team," Time, 19 September 1994. Wikimedia Commons has media related to Charles Van Doren .